Temper Corp's products are designed and manufactured to guarantee accuracy and provide the best solution for equipment and system manufacturers. Whether it be to eliminate shimming, optimize bearing life, simplify installations, control speed, or seal at high temperatures, Temper's products continue to maintain an unsurpassed level of reliability and performance. Temper Corp has been a leader in developing innovative solutions with precision for more than 30 years and continues to lead the world in bearing adjustment technology. Temper Corp's products include, adjustable spacers, metal spring gaskets, magnet rings, surgical scissors, and automated assembly equipment. These components are ideally suited to support hydraulics, valves, motors, reducers, compressors, axle wheel ends, and sensing applications. All of Temper's Products are designed and manufactured to meet the customer's application. Temper Corp's team of engineers can CUSTOM DESIGN solutions for your demanding applications. Whether it is for power transmission products, elevator systems, refinery valves, or industrial trucks, Temper Corp will provide the best solution for you! Based in Fonda, N.Y., Temper Corp has been the industry leader for more than 30 years and is an ISO-9001:2000 and AS9100:2001 certified company. Our Temper Load Rings, used in conjunction with Temper-Set™ Gage and Temper-Set™ Smart Press installation systems reduce assembly time and increase accuracy in bearing adjustment, thereby making your operations more productive. Temper Corporation's ability to adapt our products to your specific applications makes us the ideal choice for all of your precision assembly needs. Temper Spring Seals, available in sizes from 2 inches to over 5 feet in diameter, are used in a variety of applications including refinery valves, nuclear reactors, fuel cells and jet engines. Based upon your application requirements, we manufacture with a variety of metals, including alloys able to withstand temperatures up to 2000° F. Resilience of our sealing gaskets is exceptional. Temper Corporation welcomes the opportunity to create precision products to fill your sealing requirements. 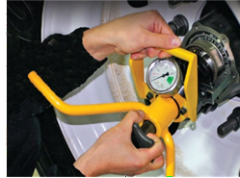 Temper's patented Speed Sense™ Magnet Rings are used for speed control, direction sensing, and counting applications. 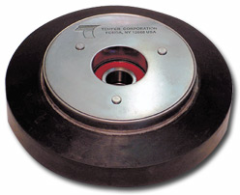 The low profile rings are press fitted to the shafts for easy assembly, and are widely used in power transmission applications including hydraulic pumps, steering assemblies, and elevator systems. We offer several magnetic pitches for fine speed and position sensing, used with Hall effect sensors. We have a great track record for coming up with practical solutions to mechanical problems: New Belleville type springs are being developed for high resilience applications, and a novel hybrid of adjustable spacers with disc springs for high temperature spring and sealing uses. Our new heavy-duty truck wheel end bearing spacer adjustment technology and Smart Press™ for various applications is now available. Fasteners and materials, and the tools and systems that automate application/dispensing and assembly/disassembly. Look for your first issue of the Fastening, Joining & Assembly newsletter to arrive soon. Video: Doctor Preload 900 Series Tool for R Drive Axle. SAVINGS YOU CAN SEE!